The India Stag Bone Slimline Hunter from Bear and Son Cutlery of Jacksonville, Alabama, will be a useful companion anywhere you'd need a rugged light hunting knife. The knife lives up to its name, with a blade well-designed for field dressing small game. The trailing point style of the Slimline's hollow ground blade puts more strength in the point and a strong convex cutting edge near the tip. The blade separates joints easily and also allows the controlled cut you need to open a carcass without damaging what's inside. There's plenty of plain straight edge for heavy cutting, whether it's meat or wood you're working on. 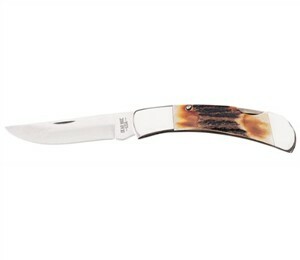 The handle of this small lockback knife uses a grip of jigged India stag bone. The jigging gives the bone the texture of natural antler and ensures that each knife will be slightly different in pattern. These very stable bone slabs sit between solid nickel steel bolsters. All materials used in the knife, including the high carbon stainless steel blade, are resistant to temperature extremes and wet conditions. Only 4-1/2 inches when closed, the Slimline Hunter is a little too much knife for the pocket. The heavier build of a Bear and Son's knife rides best on a belt, and purchase of the Slimline does include a well-made stitched leather sheath. Slip the Slimline in the sheath and snap the cover shut for secure transportation wherever you go. See the 110FG Folding Lockback Hunter from Buck Knives for a clip point hunter with an improved grip.